French but living and teaching in Turkey. Please leave a message if you download my work! Thanks! 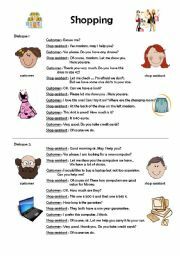 Here are some very easy speaking cards to practise the use of can and can´t. 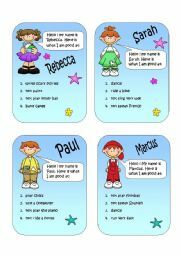 Students fill in the information from their card in the table (page2) and then go around the class asking their classmates for information about the 3 other characters. They fill in the table from page 2 using can or can´t. Fully Editable. A board game to practise daily routine vocabulary with elementary students. Fully editable. 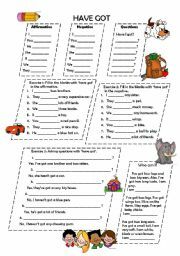 A worksheet for your students to practise forming questions. My students are so used to answer questions that when you ask them to ask something to their fellow students when working in groups, they are not able to do to so. Questions in the present simple, present continuous and with the verb ´to be´. Hope this helps. Fully Editable. More practise on the verb ´to be´. Simple sentences for beginners and yes/no questions with ´to be´. Fully editable. Two dialogues between a shop assistant and a customer. On the second page, a table to fill in with the new vocabulary. The idea is that the students then go on to write their own dialogue in pairs, learn it by heart and perform it in front of the class. Fully editable. How to use ´have got´ for beginners. Simple vocabulary. Yes/No questions with ´have got´. Fully editable. Answer key. 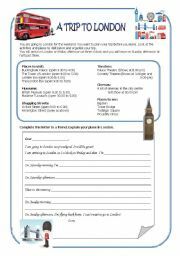 A reading and writing activity about London. Students pretend to plan a trip to London according to the information they are given. Students should be a little familiar with London´s landmarks before. Fully editable. 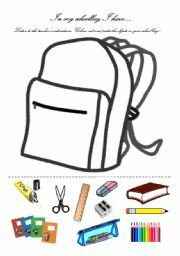 Students cut the school stationary, colour (if B&W copy) and paste the school supplies in the bag. Good fun for young learners. Fully editable. 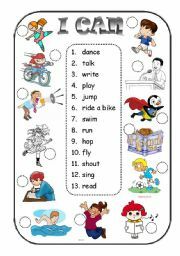 Worksheet for elementary students: Match the pictures verbs to make sentences with ´I can´. 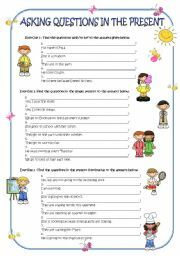 To use with the ppt that you can find here : http://www.eslprintables.com/powerpoint.asp?id=38385#thetop Fully editable. Each student is given a card. 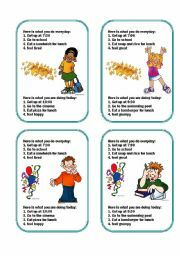 Students then ask each other questions in the simple present (what they do everyday) and in the present continuous (what they are doing today) and give answers in the correct tense. Fully editable. Pictures from Philip Martin. On each slide, students have to read about what Garfield is doing. They then have the choice between 4 different pictures. They have to click on the right one to match the sentence. Easy vocabulary for a first introduction of the present continuous to young learners. Have fun! 21 slides to practise the use of possessive adjectives (my, your, his ...). Fully editable. Have a good lesson! A ppt where students have to make sentences using the given cues. In order to make the sentences, students should be familiar with daily routine vocab, adverbs of frequency and telling the time (basic here but can easily be changed). Fully editable. Another ppt about prepositions of place (first one here http://www.eslprintables.com/powerpoint.asp?id=35571#thetop) but a little bit more difficult. It includes in, on, next to, near, under, between, in front of and behind. Fully editable. A presentation of prepositions of place for beginners with only 4 prepositions : in - on - under - behind. 22 slides. Fully editable. Have fun. Practise of ´to be´ in the present : in the affirmative and negative. Yes/no questions and answers as well. Suitable for beginners. Help collect the clothes from the clothes line and put them in the basket. An easy game for young learners. And for extra fun, some animals pass in the background. Fully editable. Have a good lesson! Saying what Garfield is doing using the present continuous tense. A simple presentation for beginners. A game with Garfield and the present continuous should follow soon! An elementary level ppt to introduce the vocabulary of the weather and seasons.